Mo Salah reacts to Liverpool's goal. THERE WERE SOME eyebrows raised during the summer when Liverpool opted to pay a reported €42 million fee for Mo Salah, potentially rising to €50 million. Yet on the evidence of his performances so far, the Egypt international has been a bargain. With 10 goals in 13 appearances (or 16 in 22 in all competitions), despite not being an out-and-out striker, he is the current Premier League top scorer — one ahead of Harry Kane. 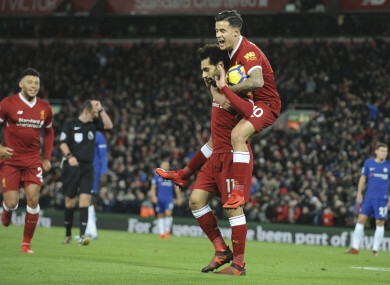 It was telling that while both Roberto Firmino and Sadio Mane were left out of the side today, Salah was retained, suggesting he is clearly too invaluable to rest at the moment. The 25-year-old’s goal against his former club this evening was also another reminder that — as with Romelu Lukaku and Kevin De Bruyne — Chelsea surely were too quick to let him go during his younger days. There has been a suggestion in recent times that he ‘failed’ during his short stint at Chelsea. However, the fact that he started just six Premier League games for the Londoners indicates he was never really given much of a chance in the first place. Tottenham have had an interesting set of results recently. Their last eight games have included losses to Man United, West Ham and Arsenal and victories over Liverpool, Real Madrid, Crystal Palace and Borrussia Dortmund, in addition to today’s draw with West Brom. However, one recurring theme in recent times has been a struggle to break down sides who defend deep and put bodies the ball. The issue, therefore, seems to be a lack of creativity. Their starting line-up today was a perfect example — it contained plenty of excellent finishers, namely Harry Kane, Son Heung-min and Dele Alli. However, there was just one out-and-out creative player in Christian Eriksen. Having two defensive midfielders in Eric Dier and Harry Winks seems a little redundant against a side such as West Brom, who are always going to set up to frustrate a team as formidable as Tottenham. The introduction of Fernando Llorente and Mousa Dembélé on the hour mark gave Spurs greater attacking threat that eventually yielded a goal, but it was too little too late for the win ultimately, as they came up short against a dogged Baggies backline. The North Londoners have looked similarly one-dimensional and short of attacking spark when up against other well-drilled backlines this season — games where they have dropped points, such as against Man United, Arsenal, Chelsea and Burnley. Consequently, it seems to be a chronic problem for Mauricio Pochettino’s side, who will surely have to start taking more risks in the final third, particularly against the so-called weaker sides. At 36, Zlatan Ibrahimovic is still proving he can influence games for Manchester United. The Swedish striker has come back from a cruciate injury — the type of setback that would likely convince many players his age to simply call it a day. Yet his performance against Brighton this afternoon suggests Man United were wise to extend his stay at the club after his original deal at the end of last season expired. Replacing Juan Mata on 62 minutes, the lively Ibrahimovic took little time to make his presence felt. The attacker won a corner with his first touch, with his introduction instantly making a difference to the atmosphere at Old Trafford, after home supporters had been treated to a frustrating hour of football. United are currently just five points off table toppers City, though their neighbours have a game in hand. If Pep Guardiola’s men hit an unexpected slump over the course of the notoriously intense Christmas period, the Red Devils will need their natural leaders like Ibrahimovic to galvanise the dressing room so that they can take full advantage of their rivals’ prospective woes. In addition, when Romelu Lukaku is not on form as has been the case recently, the more experienced frontman can at the very least serve as a better back-up option up front than more or less any other side in the Premier League have the option of utilising. After an encouraging run of results previously, Newcastle have now lost four games on the bounce. The Magpies were well beaten today by a Watford side who moved to within three points of the top four following a comfortable victory. Afterwards, a wary Rafa Benitez sounded like a man preparing himself for a relegation fight. “We made a couple of mistakes and we paid for that,” he told BBC Sport. “They had a couple of runs down their left which were difficult to control. We were pushing in the first half, we were on top for a while but then didn’t score. 5. Hope for Hodgson and Palace? Crystal Palace’s start to the season suggested they were dead certs for relegation. Nonetheless, things have slowly improved under recently appointed boss Roy Hodgson. Palace lost all of their opening seven Premier League games, failing to score a single goal in the process. Since then, however, there have been signs of encouragement, with the Eagles picking up eight points from their last five matches. Today, however, they showed the type of spirit and resolve that will be needed in abundance if they are to avoid relegation. Playing against a Stoke side just five places above them in the table, Palace produced an unspectacular but gritty display that eventually saw them rewarded in the form of Mamadou Sakho’s dramatic 92nd-minute winner. Email “The Premier League signing of the season and more talking points from Saturday's action”. Feedback on “The Premier League signing of the season and more talking points from Saturday's action”.